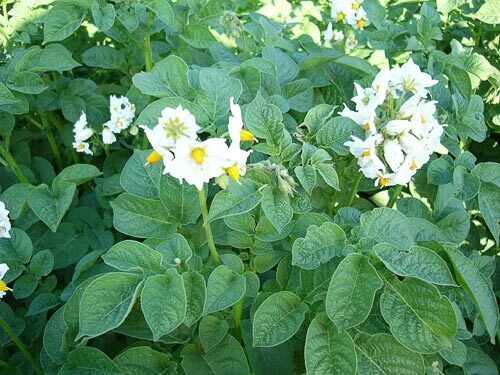 AgroAtlas - Crops - Solanum tuberosum L. - Chilean or European potato. Solanum tuberosum L. - Chilean or European potato. 2n=48. The potato plant is a perennial tuber-bearing herbaceous one. Underground its stem extends into stolons. Potato roots penetrate the soil to a considerable depth and branch out abundantly. Thicker root strands and stolons are tinged with anthocyanin. Potato tubers grow as a fairly compact cluster. They are rounded or oval, with a rather obtuse tip. They have a bulging or flat, or sometimes a somewhat bulged-in stolon scar and quite deep eyes. Tuber skin varies in color from brownish white to deep purple. Potato flesh normally ranges in color from white to yellow. Potato bushes usually are erect, ramose, and thick. Potato stems are powerful, often with shortened internodes. Potato leaves are relatively dense. The size of accrescent potatoes leaves is 23x16 cm, that of normal ones - 15x9.5 cm. They are feebly or medium-dissected. Lobes are oval with short obtuse tips. The size of the terminal lobe (which has a sinuate base) is 65x35 - 11 mm, that of the lateral (unequal-sided) lobe is 52x31 - 3 mm. Young leaf lobes are semi-sessile. Potato lobules' size is 13x12 mm. They have short shafts. Younger leaf lobes are covered on top with short hairs, while older leaf lobes - with long ones. Florescence is lavish. Potato inflorescences have few flowers. Flower stalks are often quite long (up to 90 mm) and thick. Each flower stalk has 1 or 2 coils bearing 5 to 6 flowers each. Potato pedicles are thick, of medium length (15-20-25/7-8 mm). They are covered with recurved hairs. In the upper tier these hairs are sparse, while in the lower tier they are thick and short. Potato calyx is of medium width, deep, sometimes strongly faceted, medium to strongly tinged with anthocyanin. Lobes are long. Their size is 8-11-(4-5x2)-5 mm. They are regularly divided. Potato corollae have a few or many folds. They are white or bluish-violet. Lobes are long and wide. Their size is about 11-13x18-19 mm (their index is about 1.5). Their reverse side is covered with hairs. Lobe cuspids are white on top and on the reverse. Anther filaments are thickened (0.85 to 1.5 mm), quite flexible, up to 4.5/1.25 to 2 mm long, strongly accrete with the corolla, and tinged with anthocyanin. They usually are erect. Anthers are often incomplete and short. Their size is 6.5-7x2-2.5/1.5 mm. Their edges are even. Pistils are rather thick, double bended or helical. Stigmae are large, high, and obtuse. Their size is about 1.2x1.0x1.1 mm. They are claviform and wide. Ovaries often have an eminence. They are large, obtuse, and flattened. Their cross-section is often tinged with anthocyanin. Potato fruit is a bacca with small seeds. In the temperate latitudes potato plants rarely bear fruit. The potato is a long-day plant. One of potato's most important physiological features is its photoperiodism. Potato plants depend on it since it regulates both their propagation by way of seeds and their reproduction by way of tubers. The number of leaves and side shoots increases with longer daylight. Larger and heavier leaves grow with shorter daylight. They have wide lobes which are sometimes less dissected as with a longer daylight. Potato stolons are affected by photoperiodical phenomena just as the overground shoots are. However the initial growth of stolons does not depend on the photoperiod and is fully regulated by the characteristic features of the species. As compared to most wild potato varieties, S. tuberosum is able to accumulate tubers with long daylight as well, and some authors consider it a long-day plant. However studies of the photoperiodical reaction in various potato cultivars reveal certain variations. They may be mostly explained by the fact that - upon the initial introduction of potatoes in Europe - they were bred with participation of both Chilean S. tuberosum varieties and of different cultivated varieties of S. andigenum native to South American mountains with their shorter daylight. The cross-breeding of these two species and subsequent involvement in breeding of wild potato varieties determined modern potato cultivars' differences both in photoperiodical reactions and in the nature and speed of their tuber formation. For satisfactory tuber formation potato plants need 15 to 18 hours of daylight. However the potato plant may still be able to form tubers with only 13 to 15 hours of daylight as well. And in the North the 20-hour photoperiod may suffice. Early-maturing varieties have a longer critical daylight length. Thus they are capable of tuber formation with a longer daylight. Long daylight oppresses tuber formation with late-maturing potato varieties making their stolons bolt overground. To form tubers these varieties need shorter daylight late in summer and in the fall. Photoperiodical conditions influence not only potatoes' growth and development rate but also to regulate a certain extent their immunity. Thus potatoes suffer more from viruses and buck eye rot with longer daylight. Potato plants are hygrophilous (especially during florescence and tuber formation), photophilous, and quite cold-resistant. Tuber buds begin sprouting in the ground at 5 to 8° C. Shoots and young plants are ruined by night and morning frosts of -2° C. The most favorable night temperatures for tuber formation are 10 to 13° C. At 20° C and above, thermal degeneration of potatoes sets in to the prejudice of the quality and reproducibility of the seed material. The vegetation period lasts 70 to 120 days. Potato plants are propagated by cloning (by way of tubers) and via seeds. Tubers have a clearly marked long quiescent period. Potato plants thrive on deeply tilled black earth, as well as on derno-podzolic soils, gray wooded soils, and reclaimed peatbogs. As for soil mechanical composition, they prefer clay sands, light and medium loamy soils. Potato plants turn a considerable amount of nutritive materials to formation of their overground parts. If the harvest is 20,000 to 25,000 kg per hectare, potato plants deplete soil nutrients to the following extent: 100 to 175 kg of N, 40 to 50 kg of P2O5 and 140 to 230 of K2O. Thorough soil tillage and correct application of fertilizers permit to maintain rich potato harvest even when potatoes are grown long on the same site. Potatoes are cultivated as a part of arable and fodder crops rotation. In the Nonchernozem Belt potatoes are grown after the turnover of the perennial herbs layer, after winter cereal crops and flax, and on sandy soils - after lupine. In the Central Black Earth Belt, in Northern Caucasia, and in the Volga Region potatoes are grown after winter annual herbs and maize; in Eastern Siberia potatoes are grown after cereal crops and miscellaneous herbs; in the Urals and in the Far East - after cereal and leguminous crops. In suburbs potatoes are usually grown as a part of vegetable rotation. Early-maturing potatoes are one of the fallow-grown crops. Organic fertilizers are applied in the fall or in the spring (20,000 to 80,000 kg of manure or compost per hectare); green manure is required on sandy soils; 20 to 90 kg of mineral fertilizers are applied per hectare: 30 to 90 kg of P2O5 per hectare, 20 to 90 kg of K2O per hectare. Good results are obtained with application of fertilizers into drills and holes while sowing potatoes - 10 to 20 kg of P2O5 per hectare and 15 to 20 kg of N per hectare; light soils require magnesium fertilizers (40 to 50 kg of MgO per hectare). Potatoes were first cultivated 14,000 years ago by the native American population. They were introduced to Europe (Spain) in 1565. In Russia potatoes have been known since the late 17th century. The second part of the 18th century witnessed widely spread cultivation of potatoes in the fields. By the end of the 19th century potatoes were cultivated on over 1.5 000 000 hectares. In St. Petersburg Pharmaceutical Vegetable Garden potatoes were first cultivated in 1786. Cultivation of potatoes in Russia was greatly promoted by the decree of the Senate of 1765. Poland, Germany and the USA have the largest areas sown with potatoes. In the Russian Federation potatoes are cultivated mainly in the Nonchernozem Belt, the Central Black Earth Belt, the Volga Region, Siberia, the Urals and the Far East. In the former republics of the USSR potatoes are mainly grown in Belorus and in the North and West of the Ukraine. In 2004 the State Register of Breeding Achievements Approved for Practical Application listed about 180 potato cultivars including 125 varieties for human consumption and 54 general purpose varieties. Main varieties are: Adretta, Alena, Bronnitsky, Vesna belaya, Elizaveta, Zhukovsky ranny, Izora, Corona, Lazurit, Lugovskoy, Ogoniok, Peterburgsky, Pushkinets, Rozhdestvensky, Sante, Snegir, Fresco, Charodey. Recent varieties are: Veteran, Victoria, Lakomka, Malinovka, Naiada, Pogarsky, Romula, Saprykinsky, Skazka. Research and breeding agencies are: All-Union Potato A.G. Lorkh Research Institute, Krasnodar Vegetable and Potato Research Institute, Bryansk Potato Test Station, North-West Agriculture Research Institute of Russian Agricultural Academy, Elets Potato Test Station. Potatoes are a valuable vegetable, food, fodder and industrial crop. Potato tubers averagely contain 23.7 % dry matter, including 17,5 % starch, 0,5 % sugars, 1-2 % protein, about 1 % mineral salts, and vitamins: C, B1, B2, B6, PP, K, carotene. As early as before WWII it was established that starch content in the tubers of such hybrids as S. leptostigma, S. demissum, etc. may exceed 30 %. Usual potato varieties contain 1.2 -1.5, rarely 2 % "raw" protein in the wet matter of tubers (as grown in Leningrad Region). Its biological value is slightly inferior to that of meat protein but is superior to that of wheat, oats and vegetables. On the average the protein nitrogen accounts for 55 % of the total nitrogen contents. All nitrous compounds found in tubers are essential for human and livestock nutrition. Some cultivated and wild varieties (S. chacoense, S. phureja, S. andigenum) have the highest protein content in tubers (6 to 8 %). Potatoes are raw material for starch and syrup production, and for distilling spirits. Potato tubers, shaw, seeds and fiber are used as fodder. Potatoes averagely yield 11,300 kg per hectare, on the best farms - 30,000 to 40,000 kg per hectare. Potatoes are planted in wide rows (with inter-row spaces of 60, 70 and 90 cm), a hectare containing 45 to 55 thousand plants (in irrigated areas - up to 60 thousand). 2,500 to 3,500 kg of tubers are usually planted per hectare (with the average tuber weight of 50 to 80 g). Planting depth is 8 to 12 cm. Ridge, semi-ridge and flat planting techniques are used. Potatoes are gathered in a two-stage, flow-line or combined way after their epidermis becomes rough and their stolons get drier. Early-maturing varieties are gathered in as soon as they get ripe enough to be consumed. After drying and grading the tubers are stocked up. Intensive potato cultivation technologies imply: the right choice of varieties of different maturing rates; use of first rate planting stock; use of soil tillage techniques which permit to form and maintain its fine-grained structure; a scientifically grounded fertilization system; close planting of warmed-up potato tubers; pre- and post-emergence treatment of crops in order to maintain the soil loose and weed-free; weedkiller application; watering schedule in accordance with vegetation periods; flow-line harvesting and post-harvesting tuber revision techniques; full mechanization of all cultivation processes. In this case potato yield increases by 7,000 to 9,000 kg per hectare.